I am so behind in posting this… Last week, I took my Mum and her UK friend down South for a few days. 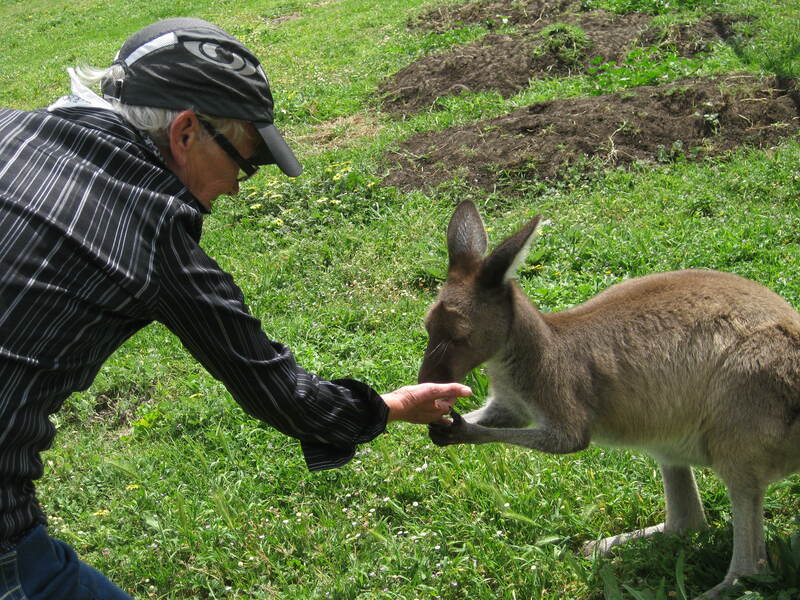 I was determined that Betty (Mum’s friend) would see some Australian wildlife and countryside. I’ll talk about the trip itself, and other stuff we did, in future posts but, for now, this one is about the lovely kangaroos we were lucky enough to meet at the Bunbury Wildlife Park. I’m not usually in to the whole “meet-and-greet” scenario at animal parks. Mostly because I feel it puts undue stress on the animals, especially if their enclosures do not allow them to “escape” from people or have hiding spots. 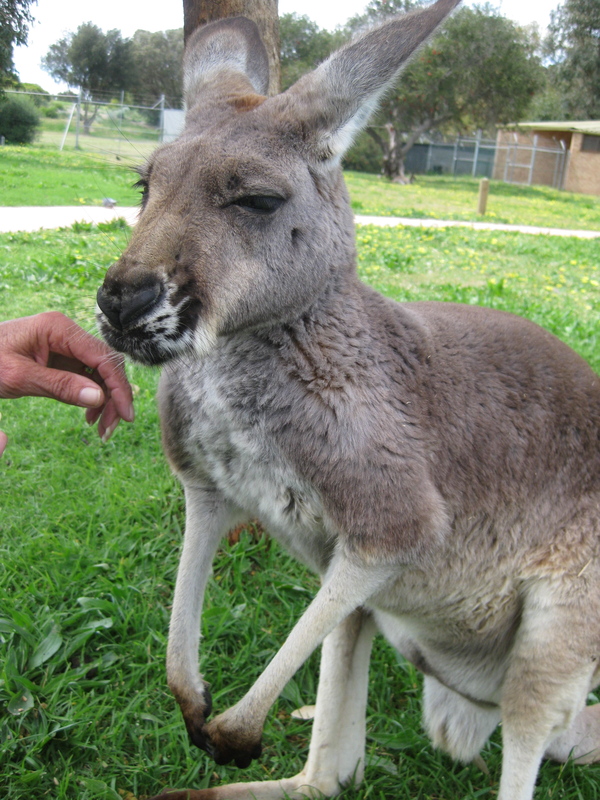 Kangaroos in particular do not respond well to stress. However, at this particular park, I felt that the majority of the critters and birds were able to get away from people if they wanted to and had plenty of hiding spots and off-limits areas where they could chill out in solitude if they wanted to, have a siesta in the sun, or just be unsociable, if that’s what they felt like being. That put my mind at rest somewhat. Besides that, I really LOVE kangaroos and desperately wanted to pat one. We had one when I was a child (it sadly did not survive into adulthood) and my Aunt has several on her property that are tame, so it’s not like I’ve never been close to them. But it is always nice to be able to touch and see them up close. They are such beautiful, gentle creatures and it is such a privilege to be allowed into their space. We were given a small bag of feed upon entry to share with the various animals and birds in the park. Gone are the days of feeding wildlife bread (ugh! so bad for them!) or those packaged pellets that I’m sure are not very exciting to the average critter. We had a mixture of different grains as well as seeds and plant fibres. This way, it was suitable for everybody and wherever you dropped it, it was sure to be enjoyed by one inhabitant or another. Parrots, ducks, wallabies and emus all shared the food, picking out the bits they liked. The males can reach up to 6-7 feet in height (which is a bit scary if you come across them in darkness whilst out on a walk. been there, done that! ), while the females are much smaller. Their average lifespan is 9-15 years, although they have been known to live to 20 years in the wild. The next fellow we encountered was a young male Red Kangaroo. The Reds are the largest species of Kangaroo, with the males often reaching in excess of 7 feet tall when standing fully erect. They are powerful and muscly (just type “muscled red kangaroo” into Google). This is reflected in their fighting style, with males generally getting into wrestling matches rather than adopting a kick-boxing style like their Western Grey counterparts. If you get “hugged” by a Red, you know about it. Luckily for us, this boy was very friendly, gentle and not interested in battling anyone. He stayed with us for ages, eating the feed and enjoying a pat. The fur of the Red is softer and the hairs shorter than the Grey’s – it is velvety to the touch, somewhat like a cross between rabbit fur and lambswool. They have distinctive black and white markings on their muzzles and have short forearms. They have quite a broader-shaped head than a Grey and their large ears can rotate in all different directions. Look at this handsome fellow! This is me getting all up in his grill. He didn’t mind. I scratched his chest, he licked my arms. We had a thing going. We saw lots of beautiful animals at the Bunbury Wildlife Park, but I am very fond of the kangaroos. I was so glad we could give Betty the opportunity of seeing some in the flesh – not just in the wild as we whizzed past in the car, or dead on the side of the road (so many – it’s so sad 😦 ) and that she got to feed and touch them. I would recommend the park. It was clean and spacious and, most importantly, the animals seemed happy and well-cared for. Of course, it is nicer to see them in the wild, doing what they were born to do but, on the other hand, it’s nice to be able to get close to them and say Hello. If you’re visiting the South West of Western Australia, take some time to visit and spend an afternoon with our beautiful native marsupials. The more people get to know them, and experience their gentle natures up close, the more they will be protected and respected in the wild. As humans, we take over their habitats and then wonder why they make a nuisance of themselves on the roads and on farming properties. We need to ensure they can stay safe in the wild, unhindered and un-harassed by so-called human progress and development. Fab post. They are such gorgeous creatures. Really enjoyed reading it. Brings back many happy memories of WA. tfs. Thank you 🙂 They ARE gorgeous, aren’t they? I don’t think I will ever tire of seeing them, even from a distance. I love seeing a big mob of them – it’s magical.